What a SUV is to cars, the Revolution Pro is to strollers. Rear drum brakes give you lots of slowing and stopping power to tame steep hills. An adjustable suspension system, padded seat and multi-position canopy ensure passenger comfort whatever the terrain and weather. Nor have parental needs been forgotten: the padded handle has 9 position options. Easy 2-step folding gets the Pro into and out of trunks smoothly and easily. Hand-activated rear drum brakes for added control. Foot-activated parking brake secures stopped position. High-impact polymer composite wheels with pneumatic tires and tubes handle tough terrain. Front wheel swivels when maneuverability is needed and locks forward to increase stability when jogging or on tough terrain. Coil spring and elastomer core shock absorbers provide 3 inches of wheel travel. 2-position shock release knobs fine-tune the suspension for varying occupants and cargo. Padded seat reclines from vertical to 70° for enhanced comfort. 5-point padded harness keep child comfortably secure. Canopy adjusts through 5 positions and 125° for protection against the elements. Large viewing window lets you keep an eye on baby. Large seatback pocket provides additional cargo room. Internal seat pockets hold snacks and toys. 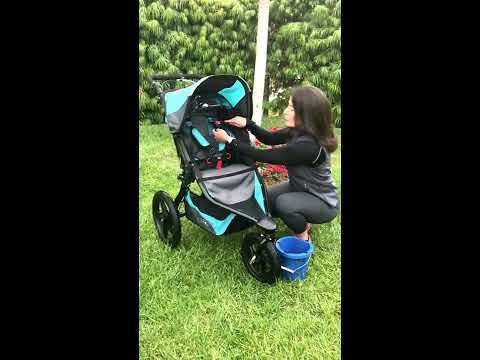 Wrist strap secures stroller when on the move and provides a handy lock when folded.